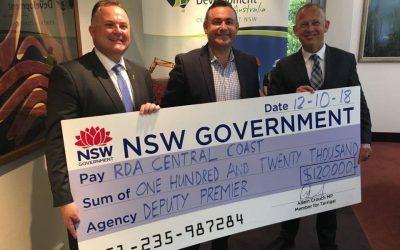 Regional Development Australia Central Coast (RDACC) has welcomed $120,000 in funding from the NSW Government, announced by Deputy Premier, John Barilaro, and Member for Terrigal, Adam Crouch, during Mr Barilaro’s recent visit to the Central Coast. RDACC Chairman, Phil Walker, said the funding will support the work of RDACC in driving economic and employment outcomes throughout the region. “RDACC works with all levels of government, business and the local community to ensure the Central Coast continues to grow a cohesive, competitive and sustainable economy,” said Mr Walker. Mr Walker has thanked both Mr Crouch and the NSW Government for their ongoing support. “As Member for Terrigal, we work closely with Mr Crouch, as we do with all elected officials, to identify our regional priorities and build capacity to support the needs of our ever-growing Central Coast population,” Mr Walker added. “RDACC is proud to partner with Mr Crouch and the NSW Government to enable the delivery of projects that create tangible outcomes for our community, including improved infrastructure, investment opportunities and job creation.